Winning by yielding. Maximum efficiency with minimum effort. This is the distilled essence of internal martial arts. Interestingly, internal styles (which include tai chi, some schools of Chinese boxing, and aikido) are not always presented with combat effectiveness in mind, although their progenitors were bona fide warriors in a league with the early soke of karate and jiu-jitsu. The development of chi or ki (subtle yet highly potent bio-energy connected with breathing) and the ability to blend with an attacker's force are topics that are taught within all martial-art systems, but receive a special emphasis in the internal martial arts. Indeed, internal styles seen as a separate category of martial arts didn't even appear until the late nineteenth century, although its principles date back to antiquity. Tai chi is quite possibly the world's oldest martial art. It is so old that its origins are lost. The practice of forms is the predominant method of training. The slow, connected movements of tai chi forms give them an aesthetic quality that make them beautiful to watch. In contrast to the typical two-minute kata of karate, the famous Long Form of tai chi can take more than half an hour to complete! Although serenity of mind and fitness are the modern goals for the practitioner of this ancient system, self defense applications do exist and enormous power can be generated through its movements via the summoning of chi/energy. Like judo, aikido is a modern style developed from jiu-jitsu. Its founder, Morihei Ueshiba, rejected what he saw as the harmful warrior philosophy of his day in creating his "art of peace". The O'Sensei wanted to create a style that was strictly defensive in nature. Circular movements without breaks are used, and focuses on those techniques that keep one from close contact with an assailant. A deeply spiritual art, there is no competition in traditional aikido. If you do karate and you're a kobudo enthusiast, it may interest you to know that internal styles feature an interesting array of weapons. 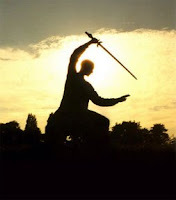 Sword forms are taught in tai chi. In bagua, specialized weapons include the saber, the spear, and deer horn knives, which have two crescent-shaped blades that are crossed. Most of the people that I know who have been involved in teaching karate for many years hold the internal martial arts in high regard. The nature and methods of these styles seem to lessen the frequency and severity of training related injuries typically seen in karate, especially as one ages. Pursuing an internal style later in life might not be a bad idea. We're not getting older, we're just getting better. I hold Tai Chi in high regards for sure. I study Tai Chi and Chi Gong even now. I am 53 and find myself adjusting my karate practice so compensate for the changes in me from this unavoidable process of life. I get up and sit in meditation for fifteen to thirty minutes; I then do chi gong exercises which have breathing techniques (as tai chi and of course karate) and then I do the tai chi short form. It has made a huge difference in my practice as well as my health. It in conjunction with karate has created a new form of practice I find beneficial. Your last paragraph was particularly interesting and true. If you were to step into our dojo, you'd find that at least 50% of my students are those who have siginificant backgrounds in Tae Kwon Do, Karate, or other "hard-style" martial arts. Why have they come to aikido? Because they want to continue their martial studies, but cannot afford the injuries they feel susceptible to at their previous martial art. I wonder if the fact that many aikidoka were previously students of other martial arts is why the combat effectiveness of the art itself is de-emphasized in every day training. After all, if you have 10 years of Tae Kwon Do experience, you've covered a lot of the combat-related topics before. A thoughtful post, as always! One of my instructors is taking sword classes. A few weeks ago he did one of the sword kata's and it was very slow for the most part, followed by brief explosions of quickness. I thought it was really interesting to watch. I think most internal styles incorporate some kind of chi gong and meditation (seated or standing) practices in their regimen. Some karate people I know do some form of tai chi, but not meditation. Besides self-defense, martial arts' main goal should be for health. Thanks, and welcome to my site. I did likewise and put your blog on my list. I'll be checking in. When I dabbled in aikido a few years back, I was surprised to see a number of adepts from other styles. Aikido may very well be a haven for other stylists, and I think a lot of it not only has to do with injuries, but the inherent attitudes that are present in karate, et al. I wonder if the fact that many aikidoka were previously students of other martial arts is why the combat effectiveness of the art itself is de-emphasized in every day training. Realizing who the founder's principle instructor was (Sokaku Takeda) and what kind of a man he was leaves little doubt in my mind why aikido evolved the way it did. I'm sure you know that Ueshiba himself was a bodyguard in his earlier days and studied a number of combative styles. Eventually, no matter who we are, we all gravitate towards peace in the end. I never saw a sword kata performed, but I have a cool photo somewhere of a blindfolded (!) sword wielder cutting a watermelon in half on some poor guy's stomach. I know it's not really martial arts, but it makes for an interesting pic! We have a taijiquand school (martial) around here. They do push-hands, the short, medium, long and extra long forms (24 to 127 movements) with partners. It's pretty much the same as what you'd see in a karate-bunkai demo. It's also very similar to what you'd see in a wushu demo. But slower and gradually sped up. Focusing on different stances. Much different stances. Strangely, in the martial school, there was less "chi" involved and much more outwards power. Much like karate. Or rather, similar to. It the taoist form of taijiquan I study, it's a gradual progression. But focused mainly on feeling Chi, relaxing muscles, and controlled breathing. Then, there's a progression/evolution to more advanced stuff, then, kikiri-do. A form of gungfu pretty similar to what is seen in the yang style form's movements. Weapons get thrown in somewhere in there. It's a reverse karate progression. Where kata like sanchin are used mainly passed 3rd or 2nd kyu. Often reserved to black belts. But, trying out many styles just goes to prove that one leads to the other that starts as the other that leads to the other that starts as the other ends. Sanchin is a good example of where karate is coming from. Ever hear of those stories about the old school practitioners breaking capillaries and developing high blood pressure from doing Sanchin? Not healthy. Neither is kumite after a certain age, for that matter. Tai chi is generally practiced for health, which I find appealing. A black belt from Shotokan used to come train at our school once in a while. Sometimes he'd show up with his Chinese tai chi buddy. I tried, but couldn't get this guy in an arm bar or shoulder lock - he had this way of shimmying out of certain moves that was unique, at least to me. One translation he had for kung fu was "takes time". I really liked that, as kung fu is supposedly an improper term used to describe Chinese martial arts (wushu) - and yet what takes more time to master than the martial arts? "Sanchin is a good example of where karate is coming from. Ever hear of those stories about the old school practitioners breaking capillaries and developing high blood pressure from doing Sanchin?" Yeah, talk about getting lost in translation. Try explaining that it's not good with the japanese hierachy-type of teaching. -good luck- Thankfully, these things got changed. A general tendancy I noted in japanese-derived-styles, is to withhold any chi-related information(or ki or qi - I'm not getting into that debate). This is not a critic, but an observation. I do tend to think that while crossing the sea, lots of information got lost and that today, more and more soft information can be found in hard styles and the other way around. Thank you, internet. While it's true that karate was initially sold as the body-strenghtening exercice that could even help you cure tuberculosis, I do think that it's only a fraction of what was initially supposed to be passed down. Having a karate background helps tremendously in taichi. It all comes together much quicklier. But the round movements are something that feels very very bizarre and a lot of time getting used to. Altering stances to include karate stances is a very hard habit to lose. In that sense, kungfu (or mastery) is exactly what the chinese man said : "takes time"
It is weird that sometimes, guys or gals from other arts arrive and suddenly seem to move differently. It just goes to show that against an un-trained adversary, your art gives you an edge, but against a trained one, that edge is lost. (Except if they trained in bullshido. :D) Then, we go back to the other age-old debate. How to train to cover that, how to make sure everything is covered and so on. Strategic choice then comes in. Then, self-evaluting what we daily practice comes in, then doubt sets in, then faith sets in and vice-versa. The human mind, especially ours is perhaps the greatest challenge we will ever face. Or perhaps it's balance? Great post on Tai Chi. I have a friend that has been doing Tai Chi for awhile now and has found that it provides great benefits for her health. I like your article but I need to add that Tai chi isn't that old compared to other Chinese MA'S. Both inside and outside of China, Zhang Shanfeng is recognised as the founder of Ta Chi. The 'therapy aspect' of tai chi is something not very old either. It was the Chinese gouvernement who pushed it in that direction (beginning of 20e century) but originally it was a real "martial art", used for combat.